As someone who has been living with dogs for 40-plus years and teaching other people how to live happily with dogs for 20-plus years, I can assure you that finding a good dog trainer, even before you get your puppy or dog, is every bit as important as finding the best veterinarian for your pet. Dog training is currently an unlicensed profession. As such, anyone, whether qualified or not, can call themselves a dog trainer, so it pays to be cautious when selecting someone that will be working with your family; you, other adults, your children, if you have them, and your dog! Below you will find criteria, in order of importance, that I suggest you use when selecting a dog trainer. Select a dog trainer that is aware of and complies with both the 2015 American Animal Hospital Association Canine and Feline Behavior Management Guidelines and The Pet Professional Guild Guiding Principles. If the trainer you are considering is not aware of these organizations and documents, look elsewhere. 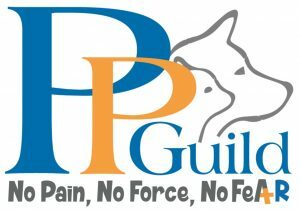 It is important to note that a pet care professional may not be a member of the Pet Professional Guild (PPG) if they violate the Guiding Principles. That is why it is in your pet’s best interest to choose a member of the PPG. The American Animal Hospital Association (AAHA) and the Pet Professional Guild (PPG) recognize the danger posed by choosing the wrong dog trainer. In the following excerpts from the 2015 American Animal Hospital Association Canine and Feline Behavior Management Guidelines the AAHA explains the type of dog trainer one should avoid and the type one should choose. The American Veterinary Society of Animal Behavior (AVSAB) is a group of veterinarians and research scientists dedicated to improving the lives of animals and people through an understanding of animal behavior. They have also published position papers that recommend against the use of dominance theory and punishment, and for the appropriate socialization of puppies. Their newest position statement outlines the importance of pet-friendly, fear-free, or positive veterinary care. I recommend that the trainer you select be aware of these positions as well. You can find links to these documents below, or by clicking on the highlighted word in this paragraph. In summary, avoid dog trainers that tell you to be “dominant,” alpha,” or the “pack leader.” Avoid trainers that use or recommend; choke collars, prong collars, shock collars, alpha-rollovers, or any tool or technique that involves the use of force, intimidation, fear or pain. A training facility may have some trainers on staff working towards their certification, but hey should be under the direction of at least one certified professional. In the case of the PPAB and CCPDT, a professional dog trainer must be in a lead teaching position for a minimum of 300 hours before they can apply to take a certification exam. It is important to understand that there are many “certifications” available and that they are not all the same. The credentials mentioned above are all issued by independent organizations and require testing, compliance with ethical standards, and continuing education to maintain certification. A “certificate” from “Don’s School of Dog Training” or “The XYZ Dog College” is far from being equivalent to the for mentioned certifications. Certification by one of the above organizations is NOT a guarantee that a dog trainers methods are free of the use of force, pain, or free. Always ask, and if you find that a dog trainer uses fear, force or pain, find a different dog trainer. 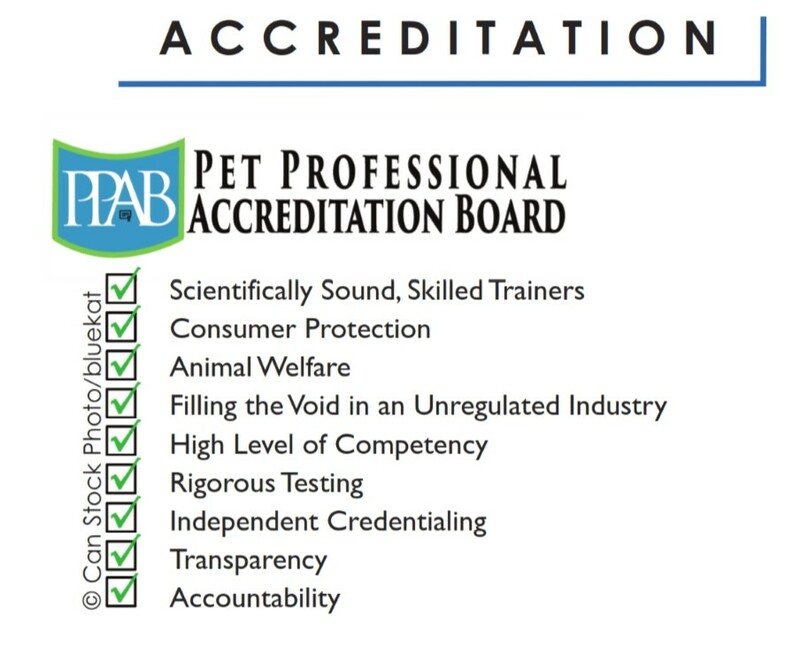 Select a dog trainer that is a member of at least one of these organizations; the Pet Professional Guild (PPG) (http://www.petprofessionalguild.com/), the International Association of Animal Behavior Consultants (IAABC) (https://iaabc.org/) or the Association of Professional Dog Trainers (APDT) (https://apdt.com/). 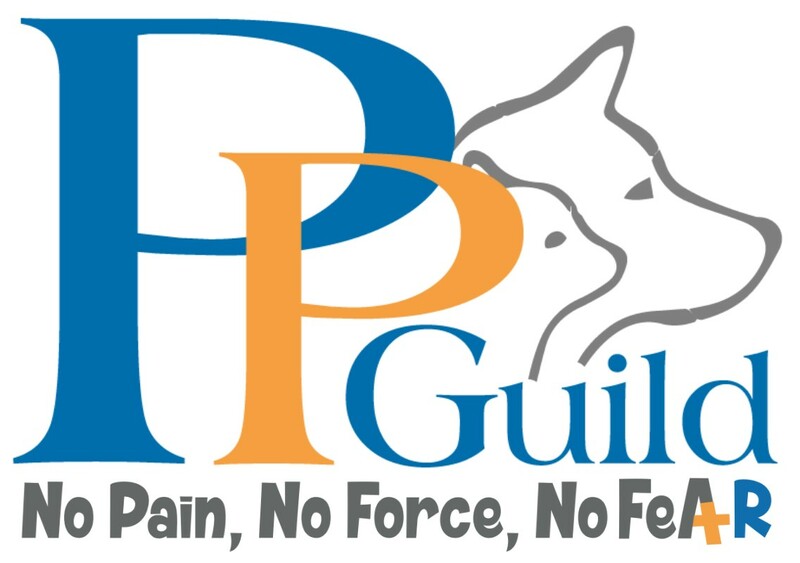 As noted above, The Pet Professional Guild (PPG) is currently the only pet care organization that has a strict code of ethics ( Guiding Principles), which denies membership to those that would use pain, force or free. That is why it is in your pet’s best interest to choose a member of the PPG. Dog training is a rapidly evolving profession, and those who are committed to it are members of these organizations as a way of staying current in the field. The three organizations mentioned above offer a wide variety of continuing educational opportunities for those in the pet care profession. Look for dog trainers who treat people and dogs with respect, rather than an “I am the boss” attitude. Remember, you will be the one being taught by this person. A professional dog trainer not only needs to be able to train dogs, but they also need to be able to teach people of all ages. Classes should be such that both you and your dog look forward to attending. Ask the instructor about their methods for teaching people. Do they provide comprehensive written materials? Do they demonstrate how to teach a behavior? Do they coach you as you practice with your dog? Are they available for questions outside of class? Not all people learn the same way. Training classes, whether private or group, should accommodate an individual’s learning style. Look for classes with at least one instructor for every eight students. At Green Acres, a Basic Manners class of 5 students will typically have two instructors so that we can give every student the individual attention they require. A forty-five minute class with 15 students and one instructor, not uncommon in the profession, leaves very little time for individual instruction. Avoid trainers who object to using food as a training reward. 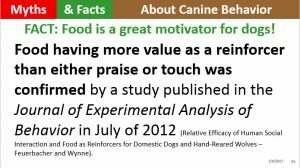 Food is an acceptable positive reinforcement training tool. Just like us, our dogs do things because there is something in it for them, usually food. 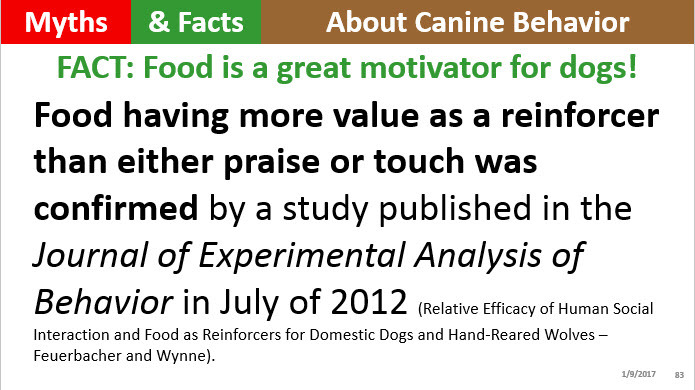 Research demonstrates that with most dogs, food is a better reinforcer than play and touch. Praise typically has the lowest value as a reinforcer. If a trainer insists that dogs should work for praise only, ask him if you can take their classes for free if you tell him they are a wonderful trainer. You can be assured that praise will not work in that scenario. Ask to observe a training class before enrolling. Are the dogs and people having a good time? Talk with a few participants and see if they are comfortable with the trainer’s methods. If a trainer does not let you observe a class, don’t enroll. However, understand, that the trainer will focus on the students in the class as you observe. Any questions or comments should be directed towards the trainer after the class is completed. Check references. Ask area veterinarians, animal shelters and rescues, boarding kennels, daycares, and groomers whom they recommend for training, and why they recommend them. Check several references so that you know you are getting objective recommendations. Avoid trainers who offer guarantees about results. Trainers that guarantee results are either ignoring or do not understand the complexity of animal behavior. No living thing is one hundred percent predictable, and training a dog involves many variables that a dog trainer cannot control. These include your level of commitment and your compliance with the trainer’s Most professional training organizations have a code of conduct or ethics statement that strongly suggests that trainers should not guarantee specific results. Ensure your dog trainer will take care to protect your dog’s health in a group setting. Ask if dogs and puppies in classes are required to be vaccinated before class and, if so, which vaccines are required. 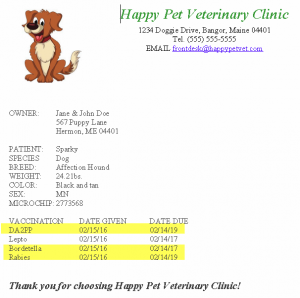 Make sure you and your veterinarian are comfortable with the vaccination requirements. The PPG suggests that you ask any prospective trainer 10 questions <Click here>. I have reproduced these questions below along with how we would answer them at Green Acres Kennel Shop. What dog training equipment do you use when training a dog or do you recommend I use? – We recommend the use of a 6-foot leash, a regular flat collar or a front-connect or rear-connect harness, a treat bag, some treats, and a clicker. We recommend against the use of choke, prong or shock collars or any equipment that is intended to punish, scare or hurt a dog. What happens in your training program when the dog responds in the way you want him to? – When a dog responds in a manner we desire, we reward the dog with food, a toy, attention; something the dog likes. We remind people that many times the dog is ignored when they are good and gets lots of attention when they are doing something we do not like. Make a point of looking for opportunities to reward your dog, even when you are not training. What happens in your training program when the dog responds in the way you do not want him to? – We teach you how to manage your dog and their environment to prevent undesirable behavior. We suggest that you ignore or redirect any behavior that occurs that you do not like, as long as it is not dangerous to any living thing or could result in the destruction of something valuable. To pay attention to this ‘bad’ behavior could actually be an unintentional reward to your dog, making it more likely to occur again. For example, if the dog jumps up on you and you push them off saying “No,” you have just given the dog attention in three ways, you touched them, looked at them and spoke to them. Jumping on a person is often an attention seeking behavior, and if you did what I just described, you have rewarded it threefold. After the ‘bad’ behavior is interrupted, you can look at ways that you can reward a mutually exclusive behavior or prevent the behavior from happening in the future. How will you punish the dog or advise me to punish the dog if he gets something wrong or exhibits a behavior I do not like? – We do not punish dogs for behavior because it is counter-productive. 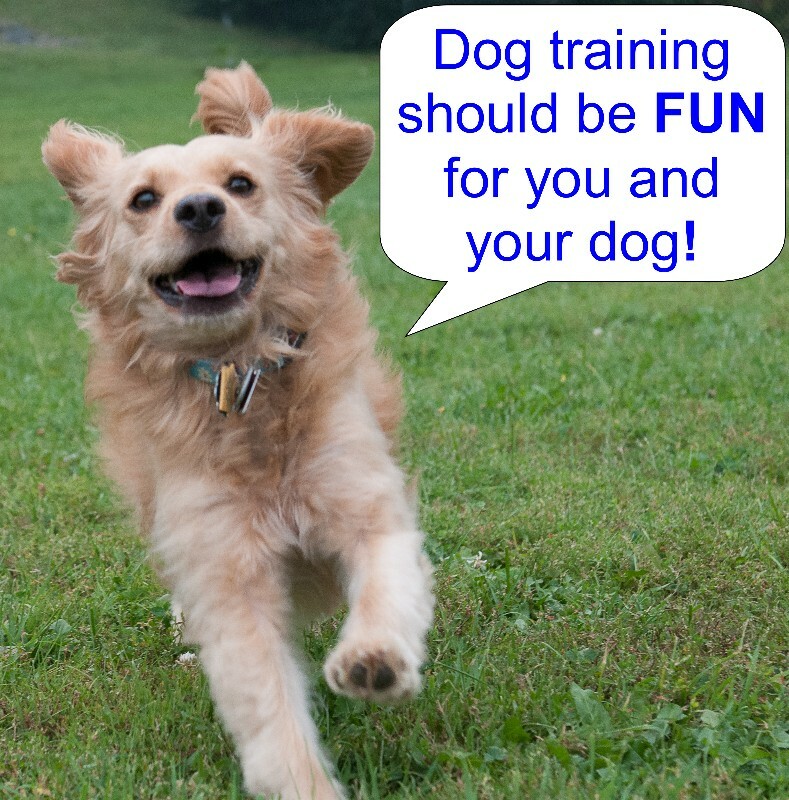 Instead, we focus on teaching you how to train and manage the dog to offer desirable behavior. Often people expect too much from a dog too soon, leading to frustration by both. That is why in addition to teaching you about training, we also teach you about normal and abnormal canine behavior, the importance of meeting your dog’s physical and emotional needs and how to manage them and their environment to prevent behavior you do not like. How do you ensure that my dog is not inadvertently being punished? 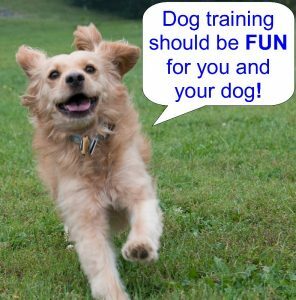 – All of our staff, not just the trainers, receive extensive training on canine communication and body language and stress to ensure your dog is having a good time. It is our goal to have you and your dog love Green Acres! If we see that a dog is feeling anxious or stressed, we will let you know, and we will look for ways to help reduce their anxiety. How do you know that the type of reinforcement you have selected to train my dog is appropriate? – We have experience in using a wide variety of reinforcers to motivate your dog. We will start teaching you about reinforcers and how to choose the right one for a specific situation at your Basic Manners orientation. How will you know or how will I know if my dog is stressed during the training? – Our entire staff is trained to look for signs of stress so that we can prevent it. Additionally, we do extensive training on canine body language and communication with all employees. We will also cover some of this material in our training classes. If you read my blog, you can find information on this topic that you can use at home. To read How Can I Tell When My Dog Is Anxious or Fearful? 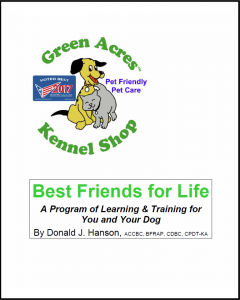 < Click Here > Even if you never take a class at Green Acres Kennel Shop, I strongly encourage you to read this article. Which professional dog training associations are you a member of? 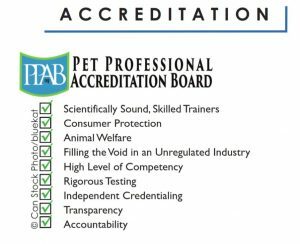 – All members of the Green Acres team; customer service, groomers, pet care technicians, trainers, and managers are enrolled as members of the Pet Professional Guild (PPG) as soon as they complete their employee training. Because of the PPG’s Guiding Principles and commitment to pet care that is free of pain, force, and fear, we believe it to be the most important of the organizations for pet care professionals. Green Acres’ owner Don Hanson is also a member of the International Association of Animal Behavior Consultants (IAABC). Will you guarantee your training results? – We do not guarantee training results because quite simply we are dealing with a living, breathing, sentient being and in reality we cannot control all of the variables, including you and what you do at home. We are here to give you all of the support we can, but you live and work with your dog far more hours per week than we do, so you will have the greatest influence on how well your dog does with training. 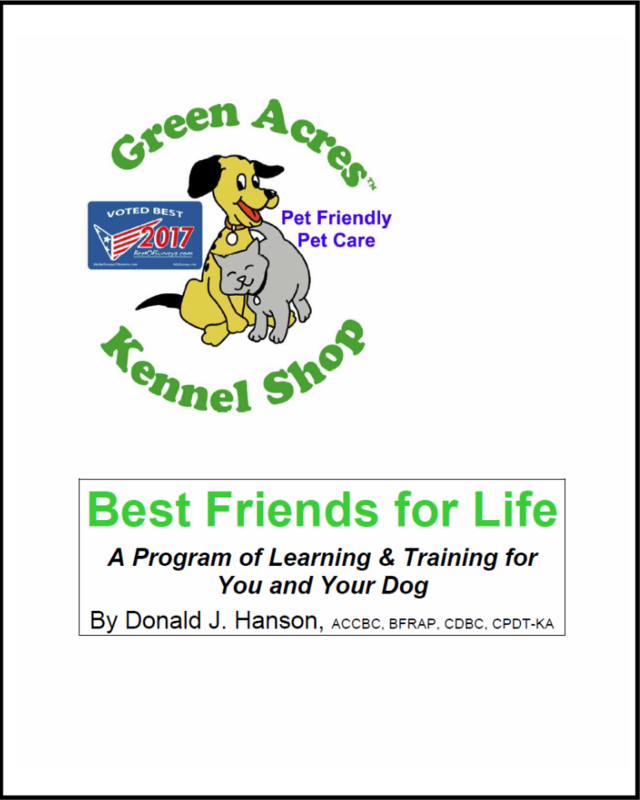 The Importance of Training Your Dog and 2018 Classes at Green Acres – Kate and Don address the questions; Why is training a dog so important, What will one typically learn in a dog training class, Why the methods used to train dogs are so important, What one should look for in a dog training instructor, and the dog training offerings scheduled for Green Acres Kennel Shop in 2018. 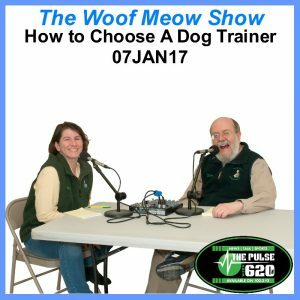 If you have a new dog, or an older dog, you will want to tune into this show so that you can how to ensure you and your dog become and remain best friends for life.